This year’s annual fundraising garden party is also a celebration of the 10th anniversary of the formation of the charity. 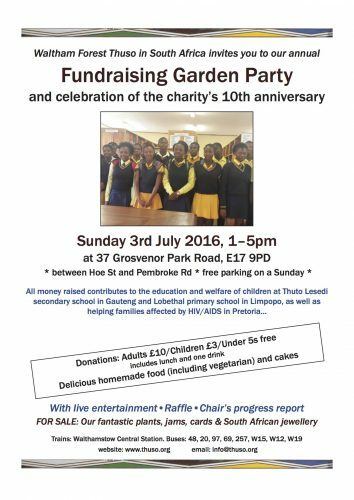 Please join us for food and entertainment on 3rd July, 1-5pm, at 37 Grosvenor Park Road, E17 9PD. This is the main fundraising event of our calendar and is always a lively affair. Most importantly, one hundred per cent of all the money raised goes to fund our work with education projects in South Africa.